The ultimate in total climate comfort control, a fully ducted reverse cycle air conditioner can condition your entire home from one central thermostat. This gives you the convenience to cool and heat your home all year round just the way you like it. The ducted reverse cycle air conditioning system consists of an indoor and outdoor unit. The indoor unit is normally located within the roof space, and it is connected to a series of vents within the house through ductwork. Cool air is then circulated to all rooms. How does it work? The reverse cycle system works by removing heat from within the house to the outdoors during summer. It then uses a refrigerant to cool the building, and works on the air inside the building to ensure it is climate controlled. As its name suggests, the system is able to work in reverse during winter, transferring the available heat in the air outside to inside the home, and using the refrigerant to warm the house. Ducted reverse cycle systems are the perfect solution if you want to cool your entire home. Ducted reverse cycle systems can be enhanced with zoning, a system that divides your house into different air conditioning zones to let you vary the airflow throughout your home. Through this, you can choose to turn on the air conditioning for only one part of the house, for example, the bedroom, rather than the whole house. 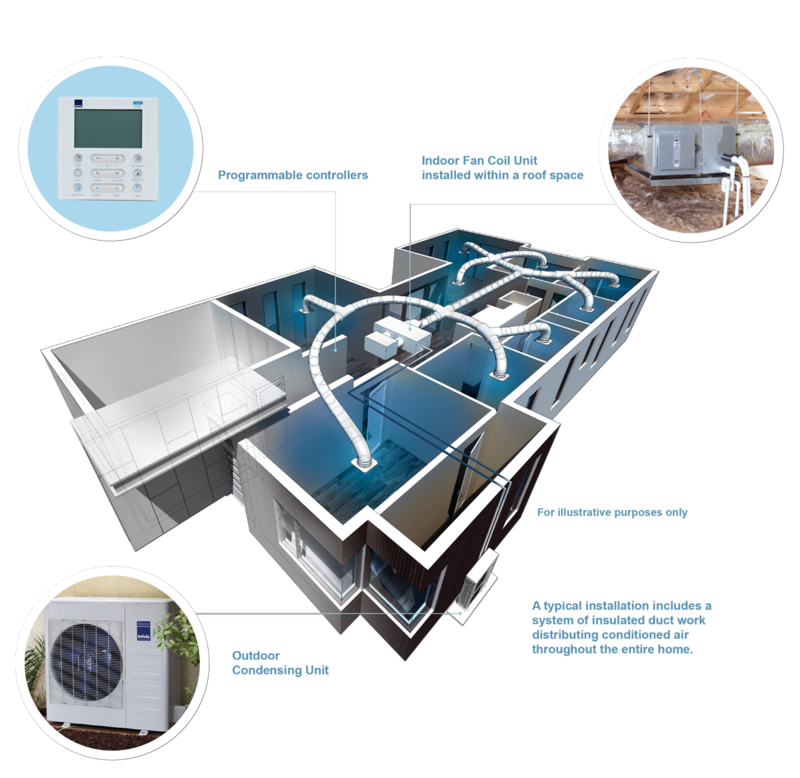 Although installation may be expensive, the bright side about the reverse cycle system is that you only pay once for a unit that essentially works the whole year round – it cools in summer and warms in winter! Plus, due to the zoning system, you won’t have to cool areas you don’t need, which means you actually save money on energy costs in the long run too. Many modern reverse cycle air conditioning units come with thermostats and advanced inverter technology, allowing them to adapt to the temperature and condition of the room. The inverter technology is one of the most energy efficient ways to cool your home using electricity. The reverse cycle system uses sensors to keep rooms at the targeted temperature, and is one of the most effective climate control systems. Say goodbye to rooms that constantly fluctuate between being too cold and too warm! Some manufacturers of reverse cycle air conditioning systems are now investing in and developing technology to reduce operating noise across their units, which means these systems are not as noisy as some of the other air conditioning options. With ducted reverse cycling air conditioners, you don’t have to worry much when it comes to styling your house and rooms. As the main cooling unit is normally located in the roof space, the only things visible inside your house are the controller, the return air and discharge grilles or ceiling vents. This makes it far less visually intrusive than some of the other air conditioning systems. What is the main difference between a ducted system and a split system? The split system is designed to cool only one room. On the other hand, the ducted system lets you cool more than one room within your home and is able to efficiently cool large areas. If you’re looking to cool an entire house, then a ducted system might be a better option. How do I choose the best ducted cooling system for me? To choose the best system for you, there are several factors to consider: your house floor plan, the type of construction, the level of insulation, the number of people living in your house, the size and position of windows and doors, outdoor spaces, and more. To understand your needs better, please get in touch with us and our advisors will help you out.